U.S. Secretary of State John F. Kerry joins CFR President Richard N. Haass to discuss the Joint Comprehensive Plan of Action (JCPOA) on Iran's nuclear program. Kerry begins by outlining the technical restrictions on Iran's nuclear program, claiming that they considerably lengthen the amount of time it would take for the country to amass enough fissile material for a single nuclear bomb. He notes that given the alternative, which almost certainly entails war, this deal is in the best interest of the United States and countries in the region, including Israel. Over the course of the conversation, Kerry rebuts arguments commonly put forward by critics of the JCPOA and emphasizes why U.S. legislators should vote in support of the deal, allowing implementation to move forward. This meeting is special in two ways. It’s relatively rare for us to hold meetings in mid-summer. We try not to compete with vacations and swimming pools and golf courses. But as we all know, events intrude. And when they do, they’re often violent. Such was the case 25 years ago next week, when normal life was interrupted one day in early August by Saddam Hussein’s invasion of Kuwait. You’re right in talking about how the program, the capacity has built up. But do you—in one bone of your body, do you seriously believe that Iran is doing all this because it's interested in peaceful uses of nuclear energy, that they want to generate electricity? Isn't all of this about putting into place the prerequisites of a military program to produce nuclear weapons? KERRY: Well, if—they already have that. That's what I just described to you. They already have that. I mean, the horse is out of the barn on that one. So we're rolling the program back, so we build the confidence about our ability to have insight as to what they're doing. So the choice is whether or not you are going to build up a system that gives you access and insight, or whether you decide that's not worth it, let's just go to war now. I mean, that's really where you're at in this, fundamentally, because—I mean, do you think the ayatollah is going to come back to the table if Congress refuses this and negotiate again? Do you think that they're going to sit there and other people in the world are going to say, hey, let's go negotiate with the United States, they have 535 secretaries of State? (Laughter.) I mean, please. I would be embarrassed to try to go out—I mean, what am I going to say to people after this as secretary of State? Come negotiate with us. Oh, can you deliver? Please. So the choice, Richard, is not, as—you know, it's not sort of—we have an ability here to put in place what 189 nations live by, and for 15 years. Let me tell you what these guys are willing to do. They're going to roll back their centrifuges that are currently deployed from 19,000 to 6,000 for five years—10 years, excuse me. They will restrict any research on advanced centrifuges for those 10 years. There's a very limited amount, but it's so limited it doesn't take you to any practical deployment. They will reduce their stockpile of enriched uranium down to 300 kilograms for 15 years. They'll limit their enrichment to the 3.67 percent for 15 years. So you know you can get no bomb possible for at least that period of time. And we respectfully submit to people that it is forever, and the reason is we will have 24/7 visibility on their civil nuclear program, and you can't break out and start enriching without our knowing it. That's the simple reality. 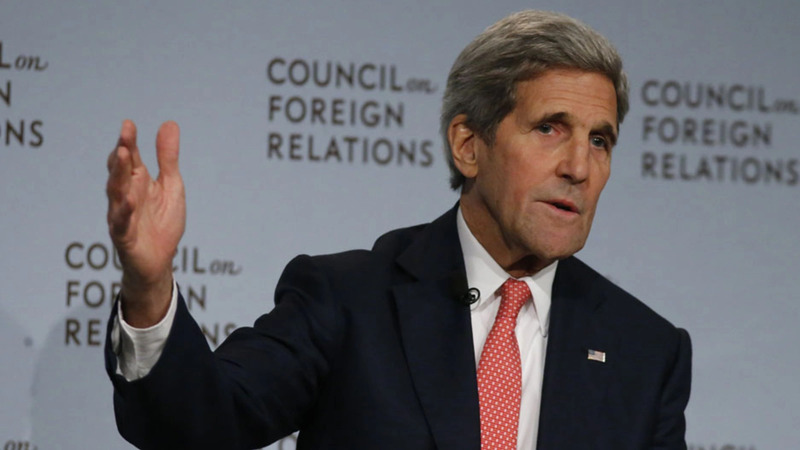 KERRY: But it never shrinks—there's no such thing as zero. The breakout time goes down to always somewhere in the vicinity of a month or two because it just takes that long to enrich. And remember what I said, breakout time is enrichment to enough fissile material for one bomb. We will see them doing that. And it's still a year or two years before they could, quote, “get a bomb.” So you have a choice here between them starting to go do that immediately right now, or you go for the 15 years and whatever transformation and changes come within Iran at the moment. Now, take a look at this. I ask you, I mean, if you talk to our intelligence community—and a lot of your people are having conversations and we're having people briefed, all the former secretaries and others being fully briefed by the intel community—but the intel community will share with you, and I will today, the IRGC is wholly against this. The IRGC doesn't like this deal. And the reason the IRGC doesn't like this deal and has been fighting it every step of the way is because it takes away the umbrella they had hoped to have for their nefarious activities in the region. That is why we have said strategic operative principle number one here ought to be don't let them get a nuclear weapon. And we’re—we believe that the regimen being put in place, in fact, prevents them from being able to do that for the lifetime of their participation in this agreement. HAASS: Are you betting that over the course of this agreement that Iran does, in fact, change significantly? You used the word “transform.” And if it doesn't, do you still believe this agreement is warranted? KERRY: No, I am not betting it. I'm suggesting that over 15 years things happen in countries. And if you look at Iran today, very educated, used to be very friendly with a lot of nations in the region, including Israel. You know, there's a long history with Persia. And the reality is that those young people, who are 20 percent unemployed, want a future. I mean, you go to Tehran today—I haven't been, but I have friends who’ve been, and people who tell me it's teeming with energy and young people who want—you know, they all have smartphones and they're buying cars. They want to be part of the world. I don't know what happens in 15 years, except that I know a lot of things change in countries. And nobody could imagine what would happen with China when Nixon went. Nobody could happen—you know, people objected to Reagan negotiating with the Evil Empire. I mean, if you don't do these things, folks, you can't create change, you don't test possibilities. What I do know is this: If we turn our backs on this deal, folks, we're sending one hell of a message to the hardliners in Iran, and they'll feel good, and we will see them. And Rouhani may—who knows what happens in an election? But Rouhani and Zarif, who have staked themselves on the potential of being able to negotiate with the West and being able to arrive at a conclusion, will be in serious trouble, in my judgment. HAASS: I'm not going to get to most of my questions because I want to open things up, but let me ask one or two more. We talked about the long term. Are you prepared to work with Congress to potentially produce some language about what would be tolerable and, by definition, intolerable or unacceptable in terms of Iran's long-term capabilities once the durations of this agreement expire? So in addition to a vote on the legislation, could you imagine some associated legislation, resolution, statements that the administration would work with Congress to basically put down some limits about the future? KERRY: Well, look, we'll work with Congress in every way and any way possible, but I think the president has made it pretty clear that Iran will not get a nuclear weapon. He's prepared to use military force, if necessary, in order to prevent that. And I will tell you, in my conversations with the Iranians we talked about it pretty directly, and they resent enormously any kind of threat. But I made it crystal clear that we had the capacity and the president was prepared to use it. It's not our first choice, which is why we're there negotiating. So I think, Richard, we're prepared to work with Congress in ways that would send the right kind of message. We would not want to send the message that, obviously, is counterproductive to the full implementation of the agreement, and to the effective transparency and accountability with respect to it. You need to also think about what the real prospect is in the long term for Shia Persia to have fertile ground in Sunni Arab countries. That's not a(n) easy mix. The Gulf States currently spend about $130 billion a year on their military. Saudi Arabia spends 80 billion (dollars). Iran spends 15 billion (dollars). So you've got to think about, so, what's going on out there? What's going on is that a lot of these countries have fancy toys—F-16s and missiles and different, you know, missile defense—but they don't have enough people on the ground who are prepared to fight, prepared to stand up and take the fight to the bad guys. And that's why we're engaged in this training concept and in this capacity-building concept, because if that gets built up you have a very different equation in the region. So I think that we have a lot of possibilities here if we pursue them intelligently and don't just react out of a kind of gut fear about Iran, because I think our—the steps we have put in place respond to that fear. One other thing I want to say. I walked away from this deal three—there's a perception. People said, oh, you guys, you know, you wanted the deal and they knew that, et cetera. I got news for you: no way. Lausanne—I went to Zarif's room on one occasion at Lausanne and said, look, you told me two days ago we were going to negotiate this and that, and if you haven't done it I'm leaving tomorrow. In London, I called him up because they were trying to walk back on the number of centrifuges, and I said I'm not coming. I’m not—you just—you decide, but I'm not coming to negotiate. And most recently in Vienna, I made it crystal clear, and I came out publicly on a Sunday night and said, look, we may not get there. And I had a conversation with them, saying point blank: you guys just may not be able to do this. You may not have the authority, may not have the breadth or political space. But it's a problem. So we had a very real clarity about what we needed to get here. The president said we got to cut off the four pathways to a bomb: uranium, Natanz and Fordow, plutonium, Arak, and covert. Covert's the toughest. But that's why we negotiated the access and the snap back and the lifetime provisions with respect to the inspections. HAASS: Why were the limits or the bans on conventional arms sales and ballistic missile sales lifted over five and eight years at the same time that other issues that were not nuclear-specific, including American prisoners and hostages, Iranian terrorism, human rights abuses—why, in a sense, did we allow the agreement to be expanded in ways that look to be helpful to Iran's agenda, but not to ours? KERRY: Well, happy to answer that. If you read Resolution 1929, it is a nuclear resolution. It's about the nuclear program. Susan Rice slipped the arms embargo thing in at the very last minute to the great consternation of Iran, who felt that it had nothing to do with the nuclear program and didn't belong in the resolution. So you had three of the seven nations that believed those things were extraneous to the nuclear provisions and we shouldn't be renewing them. We had four nations—France, Germany, Britain, and the United States—who felt otherwise because of Iran's activities. We won. We kept them in for eight years on the missiles, under Chapter—under Article 41, Chapter 7 of the United Nations, and on the arms for five years. But those aren't the only tools we have at our disposal, folks, to be able to deal with those issues. That's what's important. We have the missile control technology regime. We have the nuclear proliferation structure. We have multiple U.N. resolutions that prohibit Iran from transferring weapons to Hezbollah, to the Shia militia in Iraq, to the Houthi, to Libya, to North Korea, all of which we can enforce. Now, let me underscore to everybody here there are probably 70(,000) to 80,000 missiles of one kind or another, rockets, in Lebanon pointing at Israel, Tel Aviv. Those were put there before we began negotiating. For years, nobody has pressed this issue of the transfer of these weapons sufficiently, but we've begun to do that. A few months—a couple of months ago, I guess it was, when you saw a convoy coming down out of Iran heading towards Yemen, I was on the phone in an instant to my counterpart and made it very, very clear that this could be a major confrontation, that we were not going to tolerate it. And he called me back, indeed within a short span of time, and said they will not land, they're not going to unload anything, they're not going to go out of international waters. And then they went home. We sent the Roosevelt in, USS Roosevelt, to interdict. We have interdicted. We interdicted weapons going from Iran through Sudan that were supposed to go to Hamas. So we are engaged now in a very active effort, and we will step that up even more significantly in order to prevent these kinds of activities.